Saturday, December 8, 2018, at 8:00am Pacific. We are excited to be able to increase the number of event tickets available for 2019! Please note that limited parking will be available onsite. Onsite parking passes are $10.00 per car, per day and must be pre-purchased online when you buy your event tickets. Complimentary offsite parking will be available with shuttle options to the event venue - more information will be posted soon! Interested in Volunteering during the event? Want to work a volunteer shift in trade for your admission to the event? We're looking for a few individuals to assist with From the Ashes Idaho 2019. You will earn your event admission on the day you assist for a shift. Click here for days, times and information about the options available. 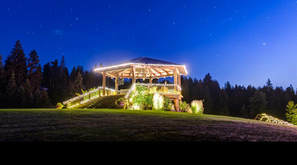 Located just 5 minutes northwest of downtown Coeur d'Alene, our event venue has served as host to all types of events over the past decade. This summer we are pleased to be the venue host for From the Ashes, showcasing smoked and fired primal cuts of meat in a variety of preparation and presentation styles on our custom-built smokers and grills -- and our culinary team looks forward to welcoming you to the feast! Headquartered in the Spokane/Coeur d'Alene community, our team has traveled the nation creating and delivering meetings and events in a wide-variety of locations. We are pleased to be part of the planning team for this event here in our hometown -- celebrating our region's food scene and connecting you with other food-lovers across the country! Need additional information? Send us a note!